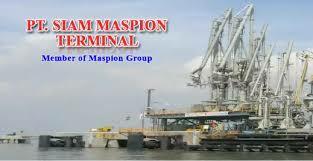 Kami adalah Perusahaan Jasa Pelabuhan yang berlokasi di Kawasan Industri Maspion, Gresik-Jawa Timur yang mengoperasikan fasilitas Jetty untuk bongkar muat bulk cair, bulk kering dan Kargo Umum. e. Able to operate computer minimum Microsoft office, preferable can operate Auto CAD 2D / 3D. f. Good knowledge in National & International Electrical Standard (PUIL, IEC, etc). b. Review drawing, lighting layout, grounding, detail of electrical installation. b. Control and monitor daily operation of project and maintenance activities of Jetty facilities. c. Ensure operational excellence with health and safety policies are complied with regulation. a. Make a berthing plan and control of Shipment schedule. c. Develop operational system in shipment schedule. b. Developing the marketing strategy for the company in line with company objectives. c. Control and monitor daily operation of commercial/marketing and planning activities. d. Ensure operational excellence with health and safety policies are complied with regulation.